Dating from about 1910, and probably in the garden of the old vicarage up the Back Lane in Worthen. This was where Rev Henry Jerrom [curate] then lived, and it was he who organised this group of players: I suspect he is sitting in the middle.The violinist sitting second from left (with the bowler hat) is Ted Benbow, and the man behind him with a cap is Bob Trentham. The cellist is Tom Ryder, a tailor, whose wife Jessie taught at Worthen school, and whose daughter Edie later taught infants at both Bromlow and Worthen schools. 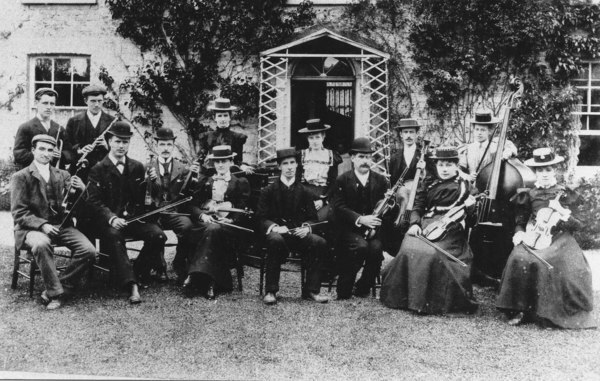 One of the sitting female violinists will be Mary Vaughan [later Mrs Mary Marsh], daughter of the Vaughans who then ran the White Horse in Worthen. A flavour of their activities can be gained from a report in the Montgomery County Times and Shropshire and mid Wales Advertiser of Nov 26th 1898. This concerned a concert that they gave in Chirbury school. The concert consisted of solo and duet songs, instrumental solos and pieces played by the complete ensemble. The latter pieces included ‘The maiden of “The Fleur de Lys”’, ‘A rustic wedding march’, ‘Minuet and Trio’, ‘Cornelius’ and ‘Slow movement in A’. Vocal soloists were Mrs Jerrom, Mrs Hatfield, Miss Speake, Mr Lloyd Jones and Mr T Ryder; instrumental soloists were Miss Davies and Mr Roberts, both violinists. Maybe they both appear in the above photograph. i can confirm it is the old vicarage we lived there for many years my stepfather had the house with the job he worked at the rectory the vicar cant remember his first name but surname was buckmaster.